Description: Mute swans are large birds, weighing up to 13.6kgs (30lbs) with a wingspan of 2-2.4m (81-94ins). Mature individuals are white with a black face. Their orange bill has a distinctive black knob at the base. During breeding season the knob increases in size for the male. This is the main characteristic, other than a larger body size, that distinguishes the male from the female. 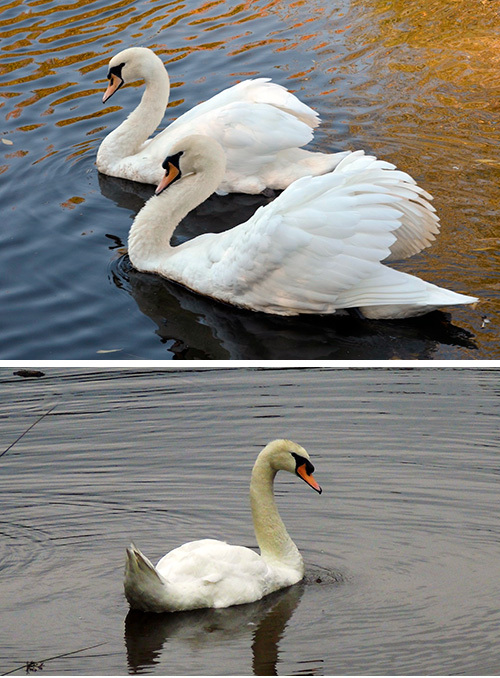 Courtship rituals between swan pairs are elaborate with heart shaped neck posturing. Distribution and Habitat: Native to Eurasia, mute swans were introduced to North America as ornamental birds. Escaped mute swans have thrived in some areas, establishing breeding populations which threaten native waterfowl due to the swans’ aggressive behaviour. Diet: Omnivores, mute swans eat aquatic plants, grasses and grains as well as snails and other small aquatic invertebrates. Life Cycle: Nests are shallow bowls, lined with soft grass and down, built on huge mounds of aquatic vegetation, rushes and grass. Clutch size is 1–11 eggs which hatch after a 35 day incubation period. Cygnets (young swans) have either a grey or white colour morph until they achieve their white adult plumage. Mute swans form close families and may keep their cygnets with them until the following year’s breeding season. Did you know? Mute swan parents are aggressive defenders of their young, and can cause injury to predators and humans if they come too close.